In this series, we’ve been looking at operators in various settings, and looked for ways to use them to shine a different colored light on some aspects school math. In the last four posts, we’ve explored the notions of equivalence and equivalence classes and representatives of equivalence classes – and saw a number of interesting things. One, we saw that equivalence classes can be likened to contour lines on a geologic survey map, the number on the contour line that indicates the altitude can be likened to the property that is the same for all the members of the equivalence class, and that one useful kind of operator is the operator that takes us from any point on the contour line towards the point (the representative member of the equivalence class) that carries the label (the number). 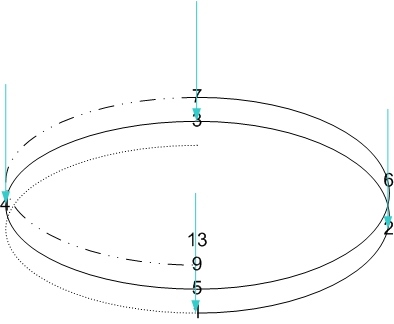 Two, that many computations involving two numbers can be split into two parts: the first part locates the two numbers as a point on the map, and the second part moves us from that point along the contour line to the representative point which carries the label. And there is additional stuff that we’ve hinted at but not anywhere fully developed, like the idea of introducing new kinds of numbers through equivalence classes. In this post I want to get started on playing with what’s known as modulo arithmetic, also called modular arithmetic, from our framework of operators and equivalence classes and properties. As a starting point, let’s take another look at the number line. In this older post, I suggest that this one thing, the number line, takes on a different character as students progress from using it for counting to – much later – locate numbers like π and √3 on it. When we are just counting, the fact that the numbers on the number line are carefully spaced is not critical – but what is important is that the mark for 4 comes after the mark for 3 and the mark for 5 comes after the mark for 4, etc. The number line is usually drawn as a straight line, but this may only be critical once we start to use number lines as axes on graphs. 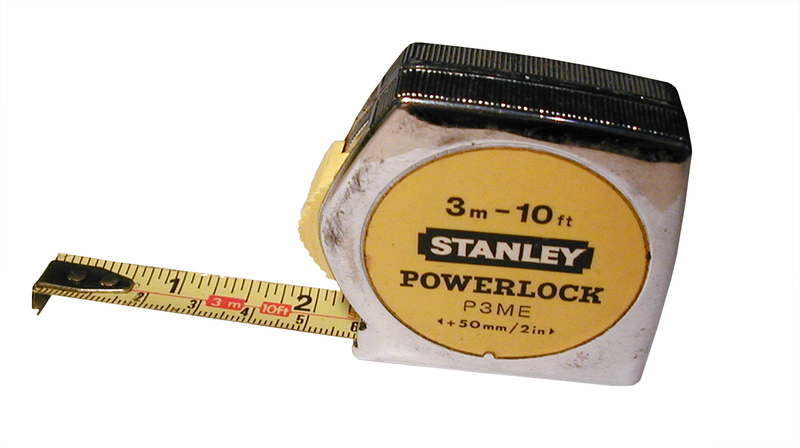 The measuring tapes shown above, whether in inches or centimeters, are essentially number lines also, though they aren’t necessarily straight lines. 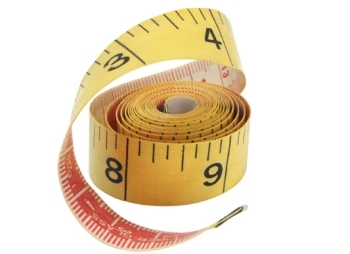 If you measure things with them, you probably want to stretch them out to be straight – but if you want to use them for many of the functions you use a number line for, it may be quite sufficient to unroll the tape enough so you can see the numbers you care about. 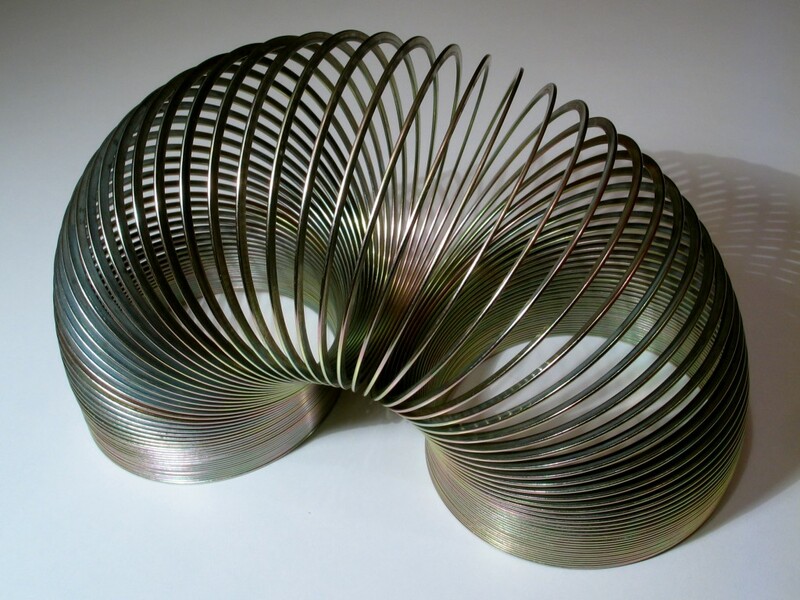 You could even take a slinky and turn it into a number line. To do so, you would have to put markings along the rim. Though the slinky would never be suitable for measuring like a measuring tape, it might serve quite well as a number line. 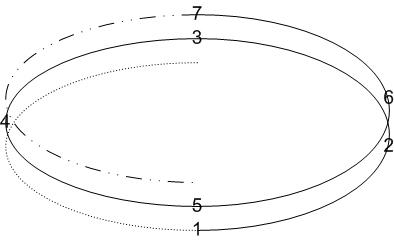 The numbers 1-7 are shown; the slinky extends in both directions, as indicated by dotted lines. Numbers are shown evenly spaced – in this particular example, precisely 4 whole numbers are placed along each circle. For example, by the time we get to “5”, we are exactly where “1” was, just slightly above it. Another way of talking about this equivalence is that we consider equivalent all numbers that are 4 apart. The representatives of these equivalence classes, just like in our earlier posts, are found at the end points of the blue arrows. So 1, 2, 3 and 4 are the representatives. There is nothing magical about this particular choice, you can make a very good case for using 0, 1, 2 and 3 as the representatives instead. We could also have picked -2, -1, 0 and 1. In a sense, it is too early to argue which make for the best representatives – we haven’t looked at relevant operations yet. In the next post, we’ll apply this particular equivalence structure to the operations of addition and subtraction. This entry was posted in Uncategorized and tagged black box, denominations, equivalence, extending patterns, invariants, look-up, models, naming, recurrence relationship, representations. Bookmark the permalink.